If you’re thinking about freshly paving or repaving your driveway, one of the first decisions you have to make is what material to use – concrete or asphalt? There are pros and cons to each, but in the cold climate of Minnesota, concrete can’t be beat. Concrete paving is typically somewhat more labor intensive than asphalt. While this does mean that concrete paving costs a bit more, you gain an additional 10 years or more of projected usefulness. In addition, concrete offers customization options that asphalt does not. Concrete can be blended in a number of different colors, allowing you to select a driveway tone that compliments the colors of your home. Concrete can also be stamped or stenciled to create a unique look and add to your home’s curb appeal. Concrete requires less frequent resealing, saving you time and money on maintenance. Once poured, concrete fully cures in approximately seven days and retains its durability for the lifetime of your driveway. Concrete driveways are also less prone to cracking, as they are better at weathering temperature fluctuations and bearing heavy vehicle loads. On average, concrete driveways are roughly twice the thickness of asphalt, making them especially resistant to wear. While cracks can still occur from weeds, excessive wear or extreme conditions, they are far less common than with asphalt. Finally, unlike asphalt, concrete is one of the most environmentally friendly driveway paving materials on the market. Driveway Guides notes that concrete is composed of water, rocks, sand and cement, all of which are materials found in nature. Worn concrete driveways can also be dug up and later reused and recycled for future driveways, making it an incredibly versatile material and a great choice for the environmentally conscious consumer. 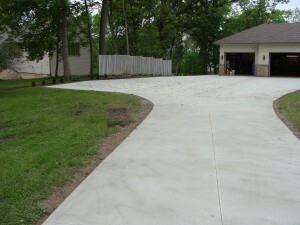 It’s easy to see why so many homeowners in Minnesota choose concrete for their driveways. Want to learn more? Give us a call today for a consultation.